Italy is famous all over the world for its gastronomic culture and certainly pizza is the staple food par excellence. Since the dawn of time, it was a dish for poor people, fast and simple (some flour and a bit of water) born to check the oven temperature before baking bread for the family. 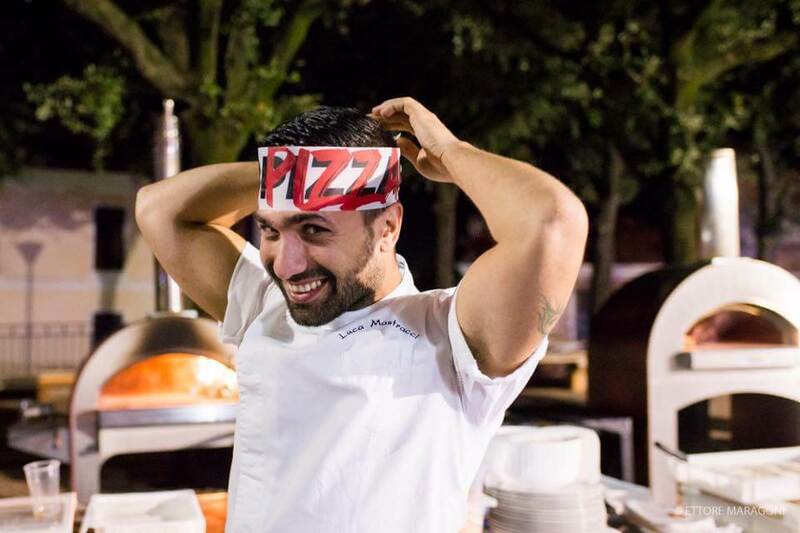 Pizza has naturally evolved through the ages, but it is still inextricably linked with the wood-fired oven, that device that took to new heights the passion, the skills and the savvy that are behind this delicacy. It may easily reach very high temperatures. It cuts down cooking times as well as operating costs. 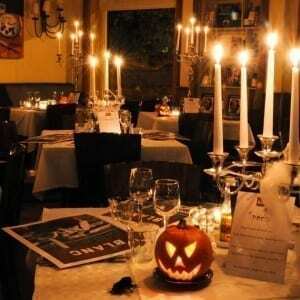 It imparts that inimitable smoky flavour to the food. It stirs fire-related ancestral memories. It fits well with the open kitchen attitude. Then we will go on to talk about how the wood-fired oven works and give you some useful tips to fully exploit its potential. What does fire mean to humanity? And to a pizzeria? Well, we could talk endlessly about it, but what is certain is that when humans learned to tame fire, they made a giant evolutionary leap. The shift to a cooked-food diet was a pivotal point in human history and fire is still in our DNA. On this subject, we suggest reading this interesting article by italialegnoenergia.it that highlights how the fire was the building block of human civilization. Cooking with fire implies a symbolic value as well, as “the fire crackling evokes primordial feelings, a family heat that warms up, protects and nurtures recalling memories of ancestral flavours”. The first oven was no more than a pit that over time developed into a clay or a brick chamber and ended up being the oven as we know it. 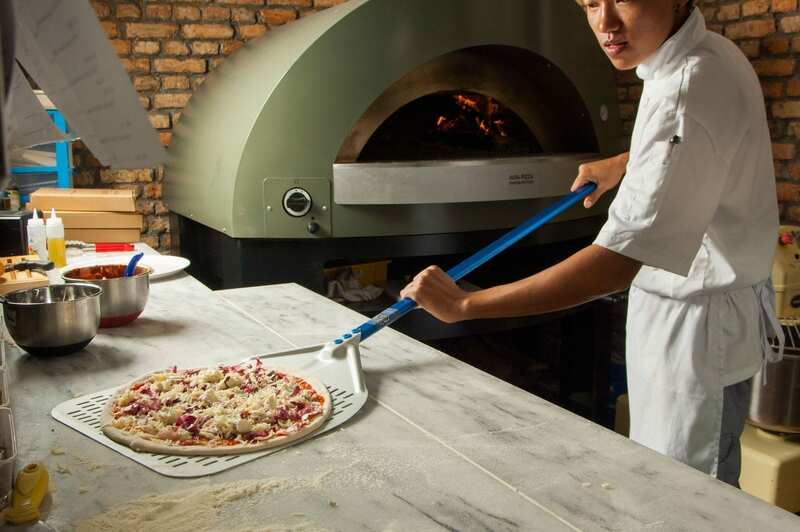 Using a wood-burning oven in a pizzeria is nowadays as much the attachment to traditional values as the sure choice of the best device for baking pizza. 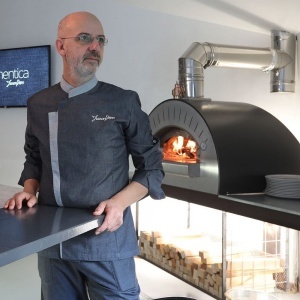 After all, the oven is the heartbeat of the pizzeria and more than other aspects will make or break your business, so you’d better stack the odds in your favour when buying it. How a wood-fired oven is made? The traditional wood-fired oven is made of bricks and concrete. It may be an outdoor or indoor oven built into the kitchen wall. You can also carve out a space under the oven to have firewood within reach. 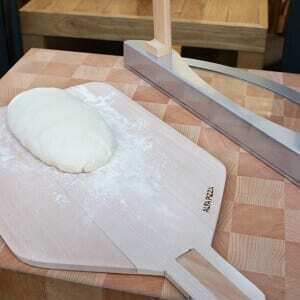 Materials and shape are key for the correct functioning of the oven. Both the bricks and the stone are refractory, i.e. they can accumulate heat and then distributing it all over the oven. The flattened oven dome forms a smaller space for air circulation thus allowing a higher temperature and a quicker cooking. The heat that emanates from the oven floor is redirected back down from the top, cooking pizzas evenly in a few minutes. The dome may be low as in Neapolitan ovens or high as in bread ovens that need more humidity. 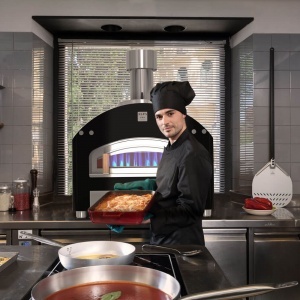 In the end, we would like to mention the free-standing ovens that can be placed anywhere you need them and though more suitable for home use may also be the right choice for a small restaurant. It all starts with the choice of the type of wood, proceeds with lighting and feeding it and ends up getting the embers to heat the oven floor. After the oven is hot, the embers are spread all over the floor and then moved to the sides. When the dome is white hot and the fire dies down, the oven is ready. 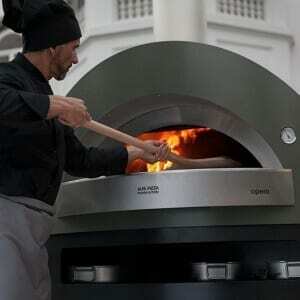 A good wood-burning oven can max out at 1 000°C (1 800° F) but pizza is usually baked at a temp of 400-450°C (850°F). Make sure to adapt the amount of firewood to the number of pizzas that will be cooked. The moisture in the oven air is very low and this enables you to cook pizzas very quickly. To keep pizza from drying too much and to improve crust quality, a useful tip is to wipe the floor with a wet rag to generate some steam before baking. Pizzas cook faster in parts that are closer to the fire, and what’s more, the oven drops in temperature in the place where it transfers heat to pizzas; for that reason, you’d better rotate pizzas 180° halfway through baking to help it brown evenly. Cleaning the oven ensures that it works perfectly. This article addresses the subject in greater detail. As a rule of thumb, clean the oven floor with a brush before baking and periodically check that there are no cracks or that the oven floor is still level. In case of damaged bricks, contact a qualified technician to replace them. 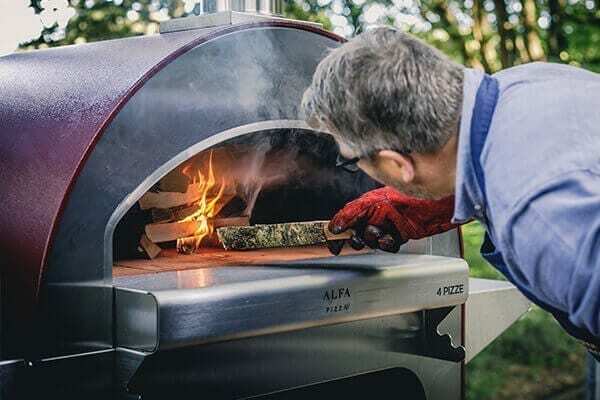 The choice of your new wood-fired pizza oven will obviously depend on many variables such as the type of place, the production volume, the space available, the pizzaiolo skills, the budget restraints and so on. 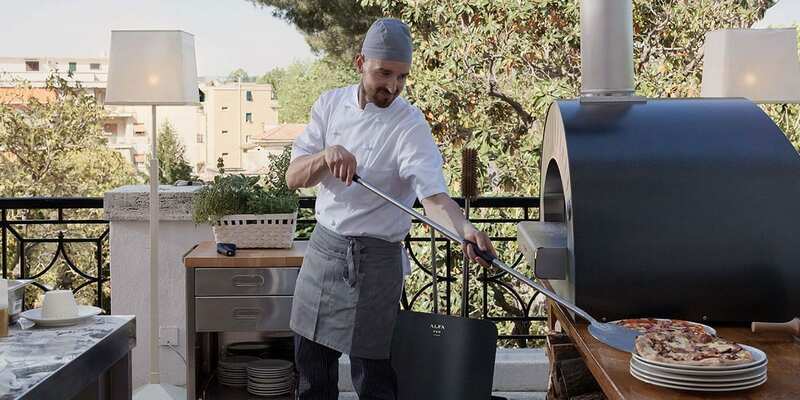 Here are some things to consider when buying a commercial pizza oven. Professional wood-burning ovens are supposed to run at full tilt for a long time, therefore they must be built with materials that meet very high-quality standards. Another key aspect is undoubtedly the energy-efficiency. Sometimes cheapest is dearest and a greater initial investment may result in a winning choice if it allows you to recoup costs in the long term. Modern ovens that combine the refractory stone technology with the stainless-steel durability enable this kind of performances. 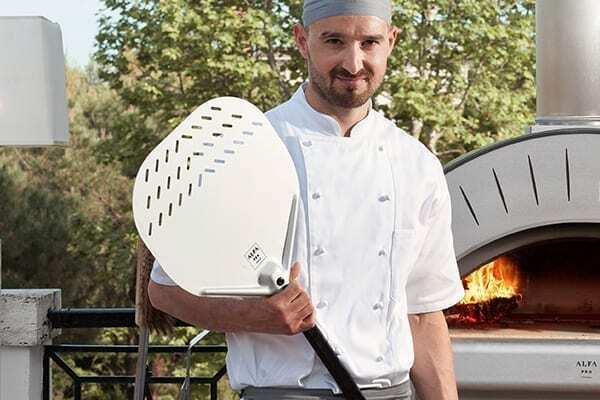 High, medium or low pizza production output will also come into play when selecting the oven to buy: the market offers devices that can hold from 2 to 20 pizzas at a time to satisfy your needs even though you are really short of space. In the end, the deciding factor may be the price that varies dramatically due to the size, style, performance and so on. Most will be in the 1 000-5 000 € range but the top-notch models will cost you anywhere from 10 000 € to 15 000 €. To sum up, a pizzeria wood-burning oven must heat up quickly and keep the heat for a long time, afford precise cooking and be versatile enough to adapt to various baking scenarios. 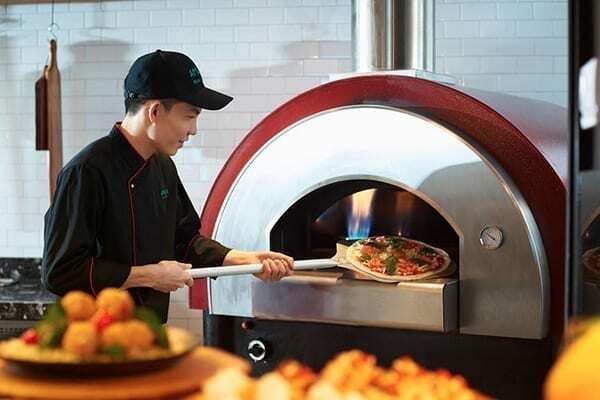 Wood-fired ovens have helped pizza spread all over the world and their renewed popularity augurs well for winning new enthusiasts in the years to come.